The Croque-Monsieur is a classic French grilled cheese sandwich that's a mainstay of Parisian cafes, bars, and bistros, not to mention innumerable take-out counters. Served with a side of French fries and a little pile of salad greens, a Croque-Monsieur is everything that's great about eating in Paris—even their snacks are somehow sublime and otherworldly. Combining a creamy béchamel sauce with nutty Gruyère cheese, the Croque-Monsieur is grilled cheese perfection. Keep in mind that most places that serve Croque-Monsieurs have stacks of the things made ahead of time, and they'll warm one up for you when you order it. And yet they're still delicious. The recipe that follows will make one sandwich, but you can double it to make two. You can substitute Jarlsberg or even Monterey Jack for the Gruyère. In case you were woxndering, croque-monsieur translates literally to "Mr. Crunch." Best name for a sandwich ever. Optional: Trim the crusts off of the bread, making the slices as square as possible. Spread both slices of bread with butter, then flip them over and spread them lightly with Dijon mustard. In a bowl, combine the cheese and half of the béchamel sauce, and mix until the cheese is fully coated. Now divide the cheese mixture in half. Spoon half the cheese mixture onto one slice of bread (on the mustard side, not the butter side), and spread it evenly. Lay the sliced ham atop the other slice, then press both halves of the sandwich together. Spray a bit of cooking spray onto the surface of a nonstick pan. Heat the pan over medium heat until the oil is hot and glistening but not quite smoking. Place the sandwich into the pan and cook for about 2 minutes, or until the bottom of the bread is a nice shade of golden-brown. 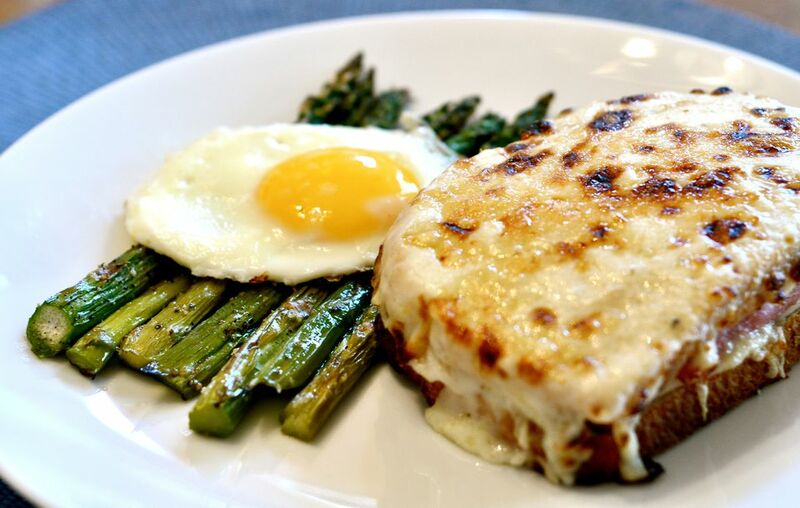 Use a nonstick spatula to flip the Croque-monsieur over. Lower the heat a bit and cover the pan. Cook for another minute or two, or until the second slice of bread is also golden brown, and the cheese inside the Croque-monsieur is fully melted. Now transfer the sandwich to a cutting board. Top with the remaining cheese mixture, then spoon the other half of the béchamel over the top. Broil the sandwich, béchamel-side up, for a minute or two until the top of the sandwich is nicely browned. Serve right away. Muenster, Gouda, Fontina, and Comté are good to use instead or in combination with the Gruyère. Substitute sliced cooked chicken breast for ham. Instead of white bread, use sourdough. Leave crusts on. Top finished sandwich with a fried egg to make a Croque Madame, possibly named because the egg resembles a ladies' hat.